back at it & Happy Halloween! I blinked and nearly two years have past since I've blogged. Oops! A new job and a new puppy proved to be quite demanding for a while. I've been settling into a more balanced routine, which includes spending more time working on sewing and quilting projects (knitting has always been 100% compatible with a codependent lap dog!). I attended a quilt show in August and was super excited about all the new-to-me fabric options and purchased a few Denyse Schmidt fat quarters and a set of these gorgeous chambray solids. 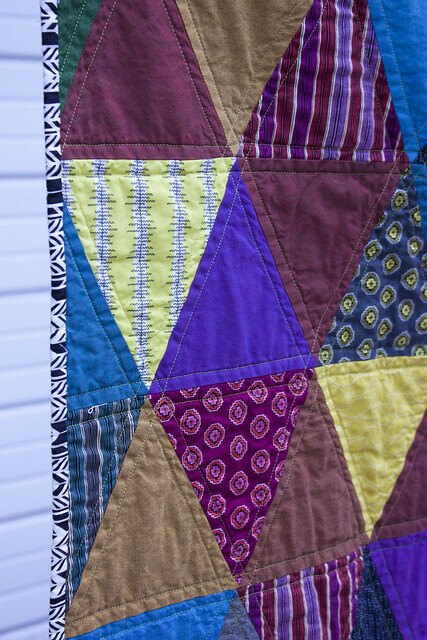 Audrie and Erica's isosceles triangle quilts were my main inspiration for this one. This was made for my friend, Jodi, in memory of a dear friend who spent many years working in the middle east. The rich color palette reminds me of the beautiful textiles and fabrics from that area. 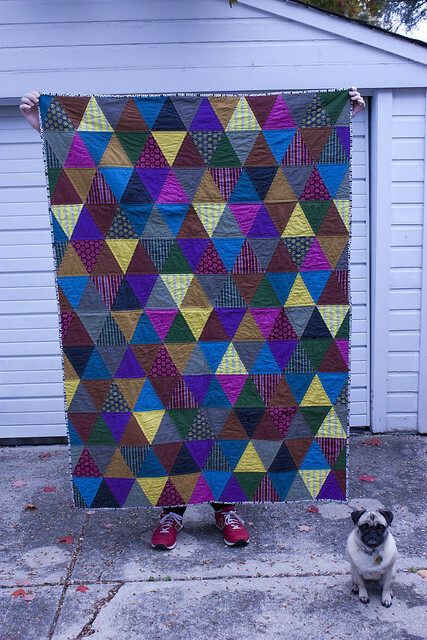 Finishing this quilt perfectly coincided with her visit from Belgium and it was fun to catch up and give it to her in person. I used the zebra-esque print because zebras are symbolically significant to Jodi. 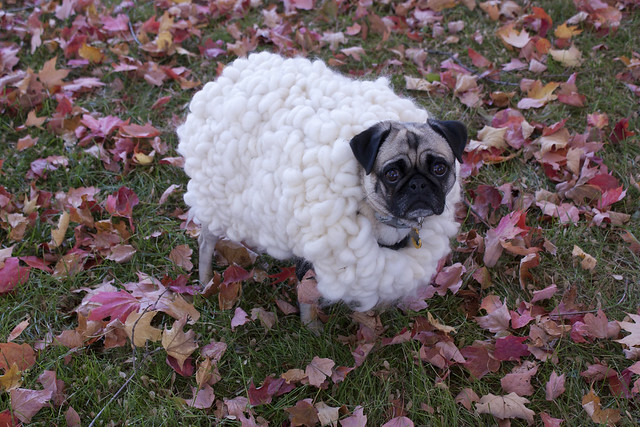 Jon is almost as obsessed with sheep as I am with knitting, so he requested a sheep costume for Koko for Halloween. I used a black dog shirt for the base of this and sewed on small loops of Polwarth and Merino roving. It took forever and was ridiculously expensive for a dog costume. There's about 12 oz of wool attached to this pup. I even had a meltdown halfway through because it was taking so long and I wanted to give up. But we're so happy with how it turned out. Next year, we're buying a costume instead! 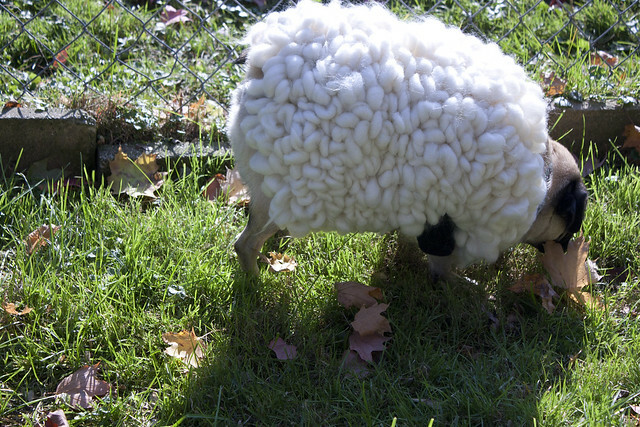 As she was walking around sniffing the yard, small pieces of vegetable matter kept attaching to the bottom side...just like a real sheep! Koko's a great sport!